With the sun shining, the blistering wind blowing outside, and men and women in their nice dresses, suits and ties, it looked like just another typical winter day at the state Capitol in St. Paul. But inside the Capitol rotunda, it was anything but ordinary. At least 334 youth and 153 adults from more than 61 organizations joined together for Youth Day at the Capitol! 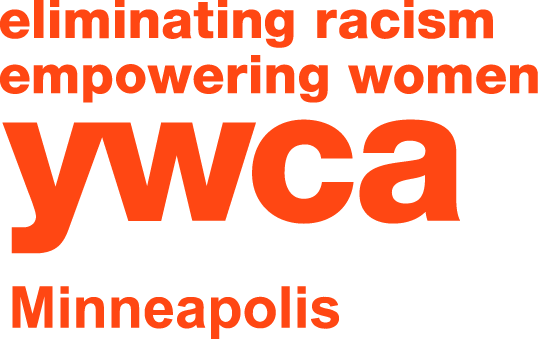 More than 40 youth and adults from the YWCA of Minneapolis came to be part of that voice. The YWCA, as a member of the Youth Policy Alliance, was also a co-sponsor of the event. Students from the Minneapolis Public Schools (KIPP, Hmong International Academy, Lucy Laney, Patrick Henry, Sanford, and MTS) came ready to ensure that their future was in good hands. 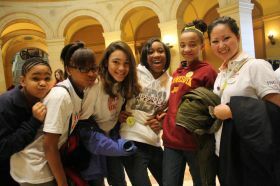 The YWCA of Minneapolis youth were then given a tour of the Capitol. The first stop was Governor Mark Dayton’s office, and then on to visit the Senate and House chambers. Students were given the treat of hearing very interesting facts about the history of each chamber. Inside the House of Representatives chamber, a painting of 16th President Abraham Lincoln hung on wall in front of the seats, symbolizing the first president for whom residents of Minnesota were able to vote after becoming a state in 1958. Students were also amazed at all the details on the walls, and the meaning of each painting and architect design. After visiting the chamber of the Minnesota Supreme Court, the students and adults of the YWCA of Minneapolis were given the pleasure of meeting Senator Bobby Joe Champion (DFL), who represents District 59 (portions of North Minneapolis and downtown Minneapolis). With a vibrant and outgoing personality, Champion detailed what he was doing in office to make a difference for the students. Safety, transportation and funding opportunities for jobs at the new Vikings stadium were just many of the issues he detailed for the students. Champion also explained that he would fight for education funding and afterschool dollars, as well as early childhood. Once the students and adults took a picture with Champion, they thanked him and headed towards the Senate Office building to meet with Senator Raymond Dehn, who also represents District 59. The students were able to sit down in a meeting room with Dehn and, one by one, each student began asking him questions that they were passionate about. Animal brutality, education in the Minneapolis public schools, and employment for felons were just some of the numerous questions asked. Dehn revealed that, though he had only been in office for nine weeks, he was fighting really hard for education dollars in the Minneapolis public schools. Other YWCA youth and staff visited several other legislators as well. The Girls and Youth department ended their afternoon with lunch at Mai Village and, with the look and smiles on their faces, each student was happy and inspired to know that their voice was heard, and will continue to be heard in the state of Minnesota.